Tuesday saw me take to the streets with Ayrshire Police Division PC John Douglas and PC Sarah Paterson. 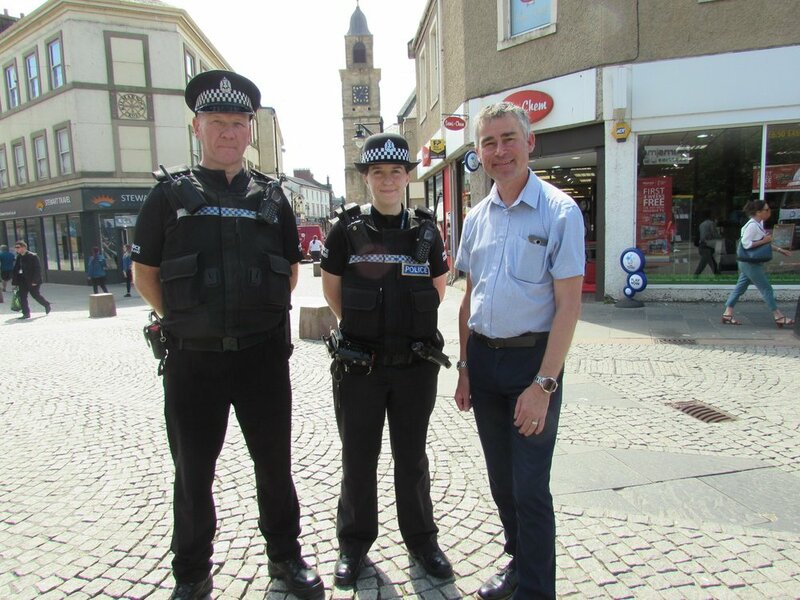 As town centre officers PC Douglas and PC Paterson work in the core town centre of Kilmarnock and the issues they focus on are Drugs, Dishonesty Crimes and Anti-Social Behaviour. They can walk up to 30,000 steps a day! and try to spend most of their time out in the town centre each day with limited time in the office. On Wednesday I began my day at my local butchers - Afton Glen Meats Galston - Afton Glen meats in Galston. Butcher Ian Holloway gave me a tour of the premises where I saw the preparation areas where he and his team make their own rolls and pies and where they butcher their meat. Ian produces over 100 dozen rolls a week along with around 1000 pies each week for his shop and another 2000+ pies for MotherwelI FC. I can testify to how great those pies are! I learned about the traceability of the meat he butchers and was then set to work making slice sausage. It’s a labour intensive process with half an hour of mincing, mixing, mincing again, kneading and then moulding being carried out before leaving the bars to set for around an hour. Each batch is made from around 30llbs of flank and produces 9-10 bars and Ian produces almost 100 bars on a Saturday alone! It was a fascinating look behind the scenes and great to get hands on experience but I’m not sure if I’ll be asked back…I managed at least to provide some amusement to the team (and wipe out their supply of plasters) with my shocking knife skills! Following my early shift at the butchers I got the opportunity to drop in to Ayrshire (East) Foodbank CVO East Ayrshire Ltd in Darvel to chat with Foodbank Development Worker, David Skilling, see their set up, meet the volunteers who keep the place running and help out a little. The Darvel Foodbank is the main storage area for the whole of East Ayrshire and sends out an average of 250 packages a month, issuing 900 packs since January and feeding 1217 adults and 612 children giving a combined total of 1829 people - That's an average of 12 people a day they feed. They rely on the support of the local community and local businesses for donations and volunteering and their loyal team of volunteers make sure that crisis packs are quickly assembled and distributed – I saw for myself this morning what a well organised set up and team they have there. Recent changes to Charity Law mean it is much harder for them to do donation drives in supermarkets. I saw for myself how low their stocks were today and now, more than ever, they are reliant on the local community making regular donations either directly to their centres or via any of their drop off points in local supermarkets. If you are a local business or community organisation who would be willing to host a donation drive then please do get in touch with my office and I can pass your details on to David.